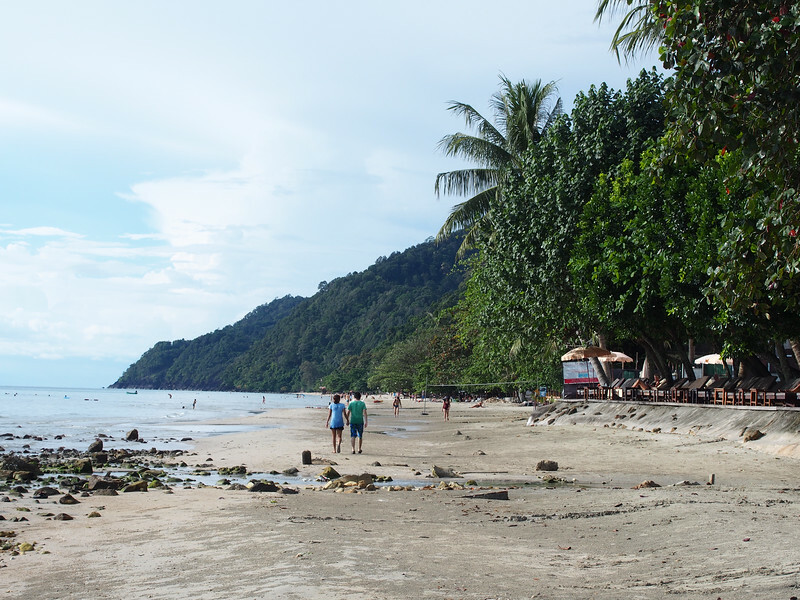 White Sand Beach is a popular resort area on Koh Chang but is it possible to do it on a budget? Was it kid friendly? And how was the wifi? Slow internet speeds and extortionist taxi drivers drove us away from our beloved Lonely Beach. We needed to find a new location on Koh Chang but this time we wanted an air conditioned room and the internet needed to be fast enough to make Skype calls. I booked a room at Koh Chang Hut Hotel for one night only so we could make sure it met our needs before arranging a longer stay. I’m happy to report that we finally found exactly what we wanted from a budget hotel. 1. The air conditioning was delightfully cold. Needed because the baby had started getting a heat rash. 2. The wifi was stable and fast enough to make a Skype call. 3. The room was very clean and had a terrace with a pleasant garden view. 4. It was walking distance to the beach and many restaurants. 5. It only cost 450 baht a night! (Low season price) They have monthly rates as well. 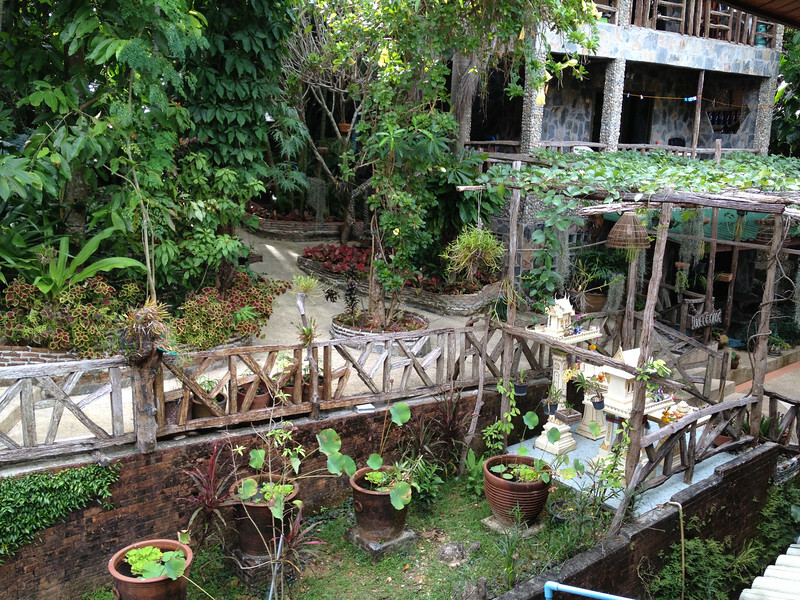 Koh Chang Hut Hotel. Budget Accommodation on White Sand Beach, Koh Chang. The view from our terrace at Koh Chang Hut Hotel. It is still low season here on Koh Chang and the beaches are not crowded yet. White Sand Beach is not quite as lovely as Lonely Beach, in my opinion, but the water is still perfect and the sand was cleaned daily. The beach is completely lined with restaurants and resorts so this is not the beach to choose if you want peace and quiet or a more tropical setting. The water here is calm but the possibility of rip currents always exists, especially during the rainy season (late May to end of October). Micheal and L.N. want me to finish taking photos so they can go swimming. 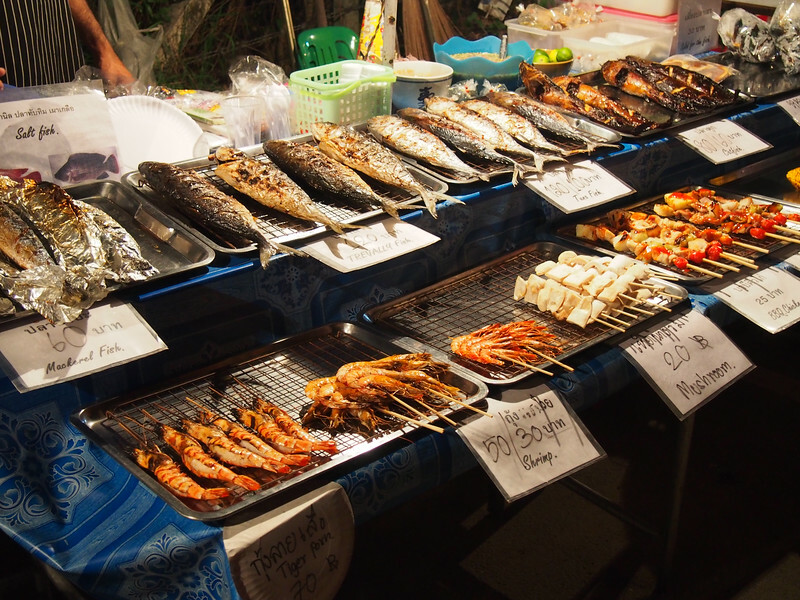 There are plenty of restaurant choices on White Sand Beach, ranging from small restaurants that serve one dish over rice for around 60-100 baht to more expensive seafood restaurants. We found most of the budget and mid-range Thai places to be mediocre so if you have any recommendations, please send them our way for next year. 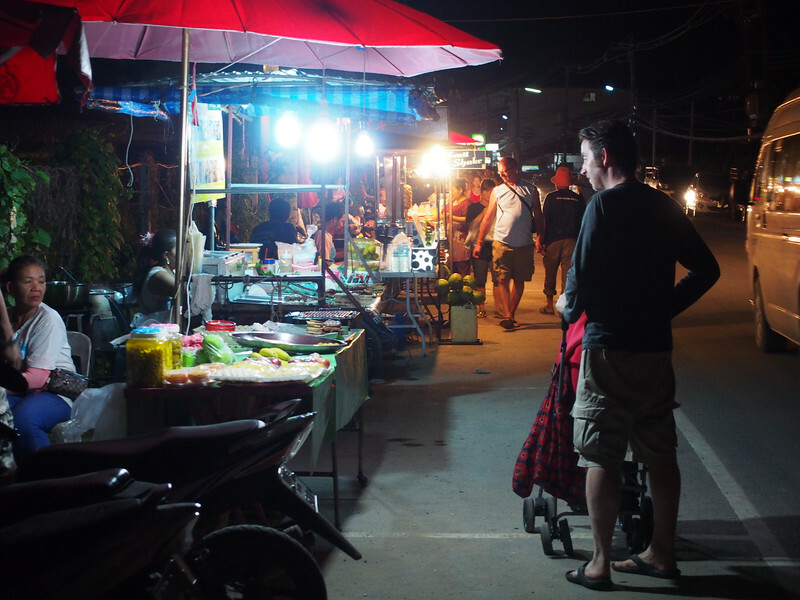 The best budget options are in the street food market that is setup everyday just before sundown. Micheal checks out the street food choices. 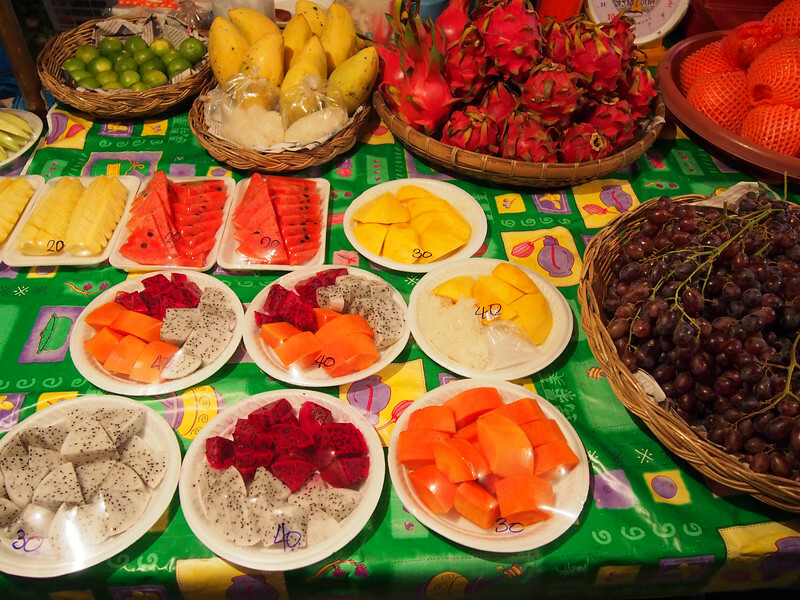 Fresh fruit starting at 20 baht. 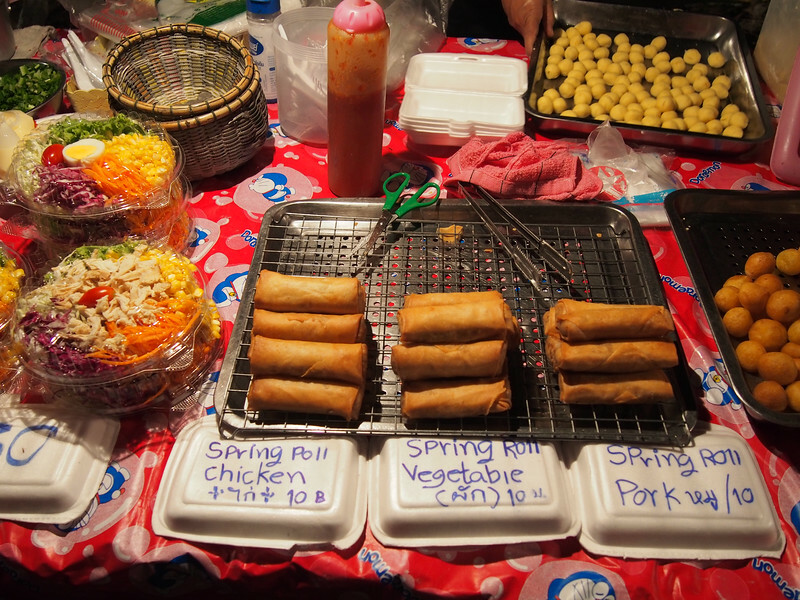 Kai nok grataa (fried sweet potato balls) and 10 baht spring rolls. 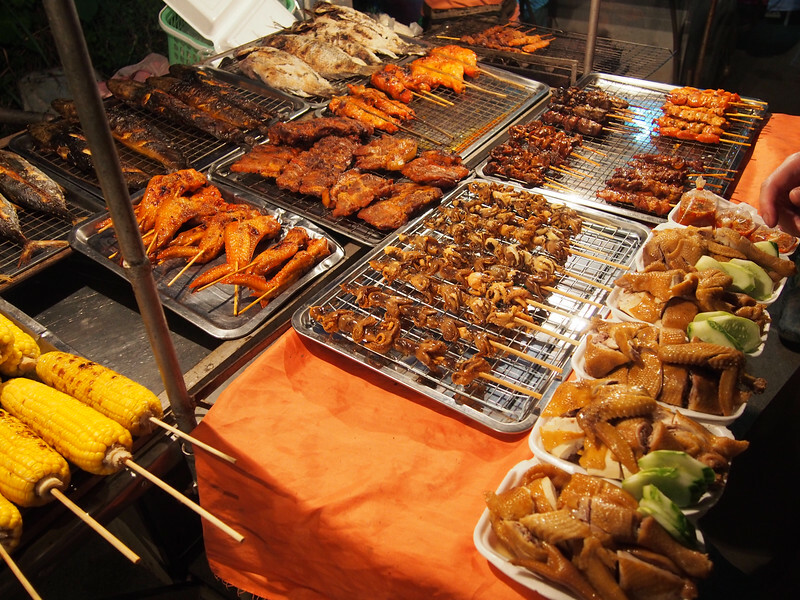 Lots of BBQ options: Chicken, fish, squid, and corn on the cob, grilled pork on a stick. But is it baby and toddler friendly? One of the reasons we moved from Lonely Beach was the lack of budget air conditioned rooms. 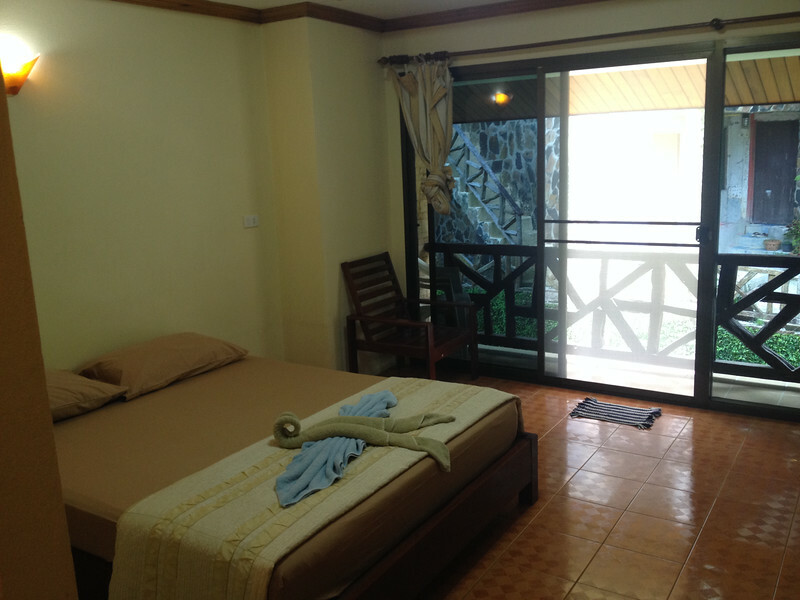 An air conditioned bungalow started at 750 baht in the low season and the same room will cost 1200 baht in November. Micheal and I are usually comfortable in fan rooms but it turns out that Little Nomad is not. 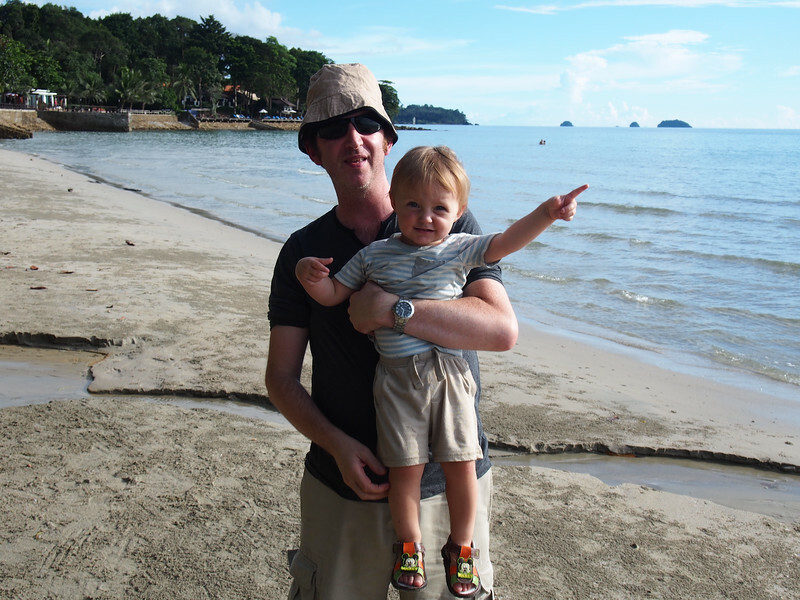 He developed a heat rash and we decided that AC rooms would be best while on Koh Chang. There is an international clinic located on White Sand Beach but it was very expensive. Prices were over 4,000 baht just to be seen by a doctor. There is a hospital closer to the ferry and it is only 300 baht to see a doctor. Either way, you are closer to emergency care on White Sand Beach than you would be at one of the beaches farther south. There are multiple 7-Eleven stores and at least one Tesco express if you need diapers or formula. Jarred baby food seemed limited to the Heinz brand. If you have a toddler who is a picky eater (ours is not), there are plenty of restaurants with familiar Western food choices. 7-Eleven also has a toasted ham and cheese sandwich that is very toddler friendly. Cut up fruit like pineapple and watermelon is available from roadside vendors and at the street food market mentioned above. The sand is clean enough for small children to play in and there is no end to the number of shops selling sand toys and inflatable rafts and toys. As everywhere else in Thailand, sidewalks can be limited or crowded with parked scooters or vendors but overall we had no trouble bringing L.N. out in his pushchair. Kai Bae beach, farther south, is said to be quieter and more family friendly than White Sand Beach. We may check it out next year.